Cooper & I were super lucky to receive an exciting parcel a few weeks ago from the amazing team over at Guru, who were kind enough to send over some samples of their products for Cooper to try out. They sent over a sample of their Surf & Turf, Full on Feast, Chicken Field Trip Bone & Venison Sausages. What a super lucky pup!!! 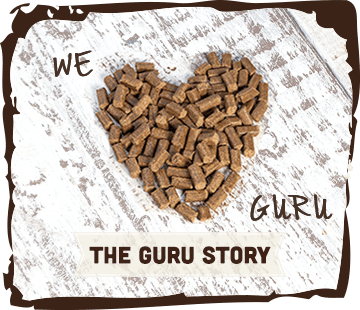 If you haven’t already heard about Guru dog food then where have you been? Since launching in 2015 their presence on social media has grown massively and they already have such a big following. 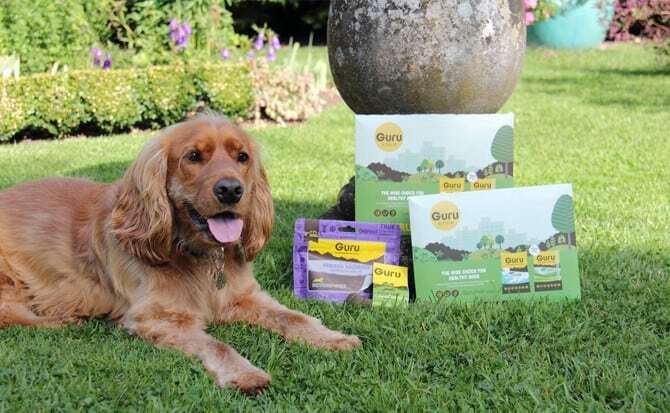 Guru, which is based in Lancashire, creates “cold pressed” dog food, a cooking method that guarantees a naturally nutritious and balanced diet for your four legged friend. It is cold pressed at a low temperature of 44 degrees to allow the tasty bites to retain all of their natural, nutritious goodness. It contains many amazing ingredients such as Beef, Fish, Carrots, Broccoli, Brown Rice & Sweet potato to name a few. To give you a little background into Cooper’s diet history, (if you haven’t already read our introduction post), he’s actually currently on an Annalergenic dog food from the the vets and has been for over a year. He suffered severely from “problem” ears with numerous ear infections as a pup and we finally discovered he was an allergy dog so the vets put him onto a special diet which meant no treats at all just the Annalergenic food. Not very exciting for a dog who loves food. Slowly we have started introducing treats to him that are Hypoallergenic alongside Carrots (which he goes crazy for!) and luckily he seems to be getting along fine with them. I personally believe the problem to be wheat, we’ve never had him tested but the odd occasion he’s naughtily stolen some bread he’s had a bad reaction and a couple of ear infections. So when I heard about Guru I was so excited to see that their Full on Feast, Surf & Turf, Trip Bones & Venison Sausages were all Hypoallergenic. Not to mention the health benefits for Cooper from cold pressed food, such as a strengthened immune system, reduced stool odor, (a winner in anybody’s book), improved skin & coat and fresher breath. As always the “proof of the pudding is in the eating” so the minute i opened up the samples of the Full on Feast & Surf & Turf Cooper genuinely seemed to get excited as he could smell it. As soon as I put it down for him he didn’t waste any time in devouring the bowl full. The samples they sent had a good 3-4 days worth which was a great amount to see how his stomach / ears responded to the new food as changes show up very quickly with him. Thankfully I’m very pleased to report that Guru was a success with him and I didn’t see any signs / symptoms of any issues like he used to get. The field trip bones are small cold pressed chicken bones made with carefully selected ingredients which are described as being perfect to take on walks or as treats every day. They couldn’t have been a bigger success with him and I genuinely think he already knows the words “Trip Bone Tuesday” as he goes crazy when you say it. Then of course there are the Venison Sausages which are made with quality ingredients and naturally air-dried to help maintain their flavor, aroma and nutrients. Guru are proud to say there’s NOTHING TO HIDE and are made from sustainabley sourced British Venison Meat. Cooper will literally do absolutely anything for them which is great for any training work we do together. Guru as a whole has really impressed me from the ethos behind the whole company, to their customer service and of course to the actual products themselves. Once his current food gets low I think we will definitely look at changing him over as he absolutely loved it. The Trip bones & Venison Sausages have already become a firm favorite and we have re-purchased some to make sure his treat box is fully topped up. I think it’s fair to say Cooper has definitely become a very happy “Geekster”. Super Cooper has a super blog & Instagram page, check them out!